The Glide bi-ski is the 3rd installment in the HOC2 ski lineup. In traditional HOC style the ski mounts incorporate DFS (Dynamic Flex System) technology, allowing the ski to flex freely and remain in contact with the snow and reduce breakage. 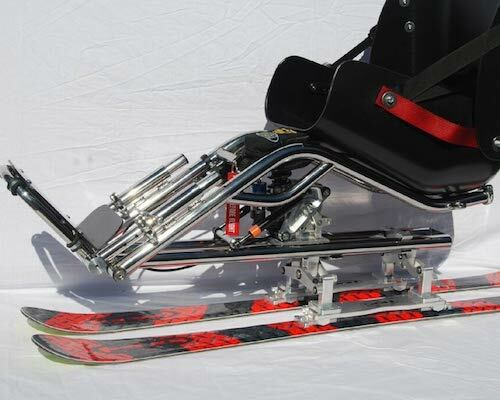 A low profile articulating ski mount keeps the center of mass low and also fully adjustable front and rear. The suspension is fully tunable for all sizes of skiers and incorporates hardened stainless steel mounts. The load assist system is truly the highlight of this ski. With the flick of a lever the system is ready in the load position. Gas springs open the frame up to chair lift height. When ready to off-load, the skier simply returns the lever to the closed position. During off-loading, gravity will help automatically return to the Glide to the skiing position. The adjustable footrest and backrest accommodate riders of all shapes and sizes. This is the ultimate bi-ski. Outfit it with a set of fixed outriggers or even make the next step in to the monoski world with our monoski interface and move to a single ski in minutes! Program/Instructor friendly design incorporates bucket assist system and tether points. Convert it to a monoski in minutes!